Back to school week is always crazy for parents, whether your kids are starting kindergarten (like one of my friends), or grade 12, which is the situation in my house. Even though I keep saying that I'm going to make Kevin pack his own lunches, I admit that I really don't mind taking the job. I work in an elementary school so I'm already packing my own lunch-why not his too? This many years of lunches have taught me a lot of things but mostly, to just relax. Forget the cutsie, complicated, ridiculous lunches you see online and in magazines. There is no medal for the best lunch packer. Find what your kids like, and make it. It doesn't matter if it's the same every day. It also doesn't matter if it looks like their favourite television character. One way to keep lunch time happy in our house was when I began allowing Kevin to rate his lunch. Thumbs up for "I love it, make it again", thumbs sideways for "it was okay." and thumbs down for "please don't make that." Doing this gave him a voice and I always promised to not take it personally. It also reduced the amount of food coming back uneaten, and as I got to know exactly what he liked (and didn't like), lunches were far more enjoyable. In grade one all he ate was grilled cheese. Grade 7, he developed a love for sprats, which are tiny sardines (his teacher hated that one). Grade 11 he had a thing for peanut butter sandwiches. When he homeschooled for awhile there, I'm not even sure he ate lunch. This year? "I don't care. Just pack what you pack. It's always good. Although, I don't eat yogurt." That's not to say I like to pack lunches-but lunches are a fact of life, so why not just embrace it? 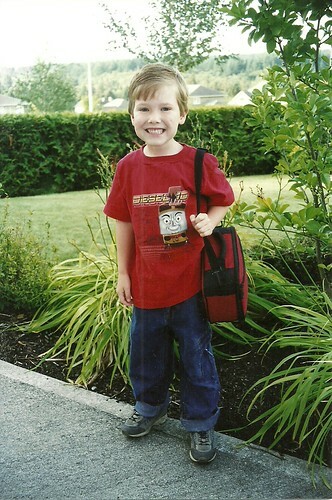 Besides, when you are at the end, I can't help but look at this photo on his first day of kindergarten and giggle at how the lunchbox is about as big as a suitcase. Leftovers are a great way to get double duty out of your dinners by turning them into lunches. Make a little extra of your kid's favourite soups, stews, and chilis to send in a thermos on cold days. This pasta is really great when made fresh, but takes on a cold pasta salad-like taste when you take it in a lunch. I added a little less olive oil, but I think you can adjust things as you like. This is a template recipe, really. Some crumbled bacon might be nice, maybe a little fresh chopped peppers, or you can add some roasted corn, even. In a medium sized bowl, toss together the tomatoes, green onions, olive oil, balsamic vinegar, lemon zest, garlic, and hot pepper flakes. Stir and set aside while you get the pasta ready. Bring a pot of water to a boil and add 1 tsp salt. Dump in the pasta and give it a good stir. Cook the pasta according to package directions, until el dente. Drain the pasta well and the dump the hot noodles right on top of the tomato mixture. Allow it to sit for about a minute before tossing it all together. Top with fresh basil and parmesan cheese, then salt and pepper to taste.